I want to give a big and hearty CONGRATULATIONS to Laura, the winner of the IDAPT i4 Universal Charger! Laura now has 48 hours to confirm! I also want to give a big and hearty CONGRATULATIONS to John, the winner of the Mederma Stretch Mark and Scar Cream Prize Pack! John now has 48 hours to confirm! I also want to give a big and hearty CONGRATULATIONS to Jennifer, the winner of the $75 Gift Certificate to Lifephoto! Jennifer now has 48 hours to confirm! I also want to give a big and hearty CONGRATULATIONS to Angella, the winner of the Vaultz Locking Letter/Legal Chest! Angella now has 48 hours to confirm! One Response to *** WINNERS *** Laura, John, Jennifer and Angella are Living the Life of Riley! CONGRATS! 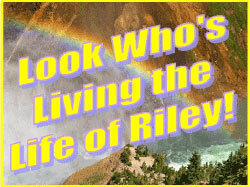 *** WINNERS *** Sarah, Heather, Valerie, Susan and Brittney are Living the Life of Riley! CONGRATS!